In his time, Batman has taken on a lot of different foes in various mediums. Whether it’s his eccentric rogue’s gallery, the Predator, or even some of his own allies. He’s even fought his own share of robots in the comics and animated series. But in comics, film, or TV, he’s probably never taken on as relentless an automaton as the T-800 from The Terminator. Thanks to a new stop-motion fan film, that is no longer the case. 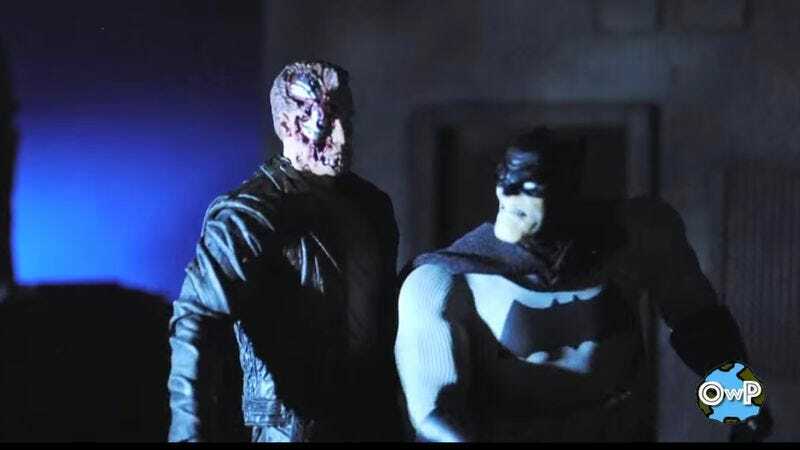 YouTube user Captain McKay has created this stop-motion battle between the two titans of nerd-dom by using various toys (Mezco’s Dark Knight Returns figure and NECA’s Terminator figure for those interested). Using the original themes from the Tim Burton film (by Danny Elfman) and the first Terminator movie (by Brad Fiedel) along with original music by Flammable Solids, McKay does a great job of immersing fans into a familiar world with these two characters. In the dystopian future where Cyberdyne has taken over and the machines are hunting down humans, only one Batman can stand against them armed solely with a computer virus, his impressive batmobile, a few batarangs, and some sweet ninja moves. It’s clearly a labor of love for McKay and he does a great job of showing a grizzled Batman going up against an unstoppable killing machine. It’s clearly an elevated form of fanfic, but that’s always been a favorite past time of nerds everywhere: Who could beat up whom if the universes were ever to cross over?